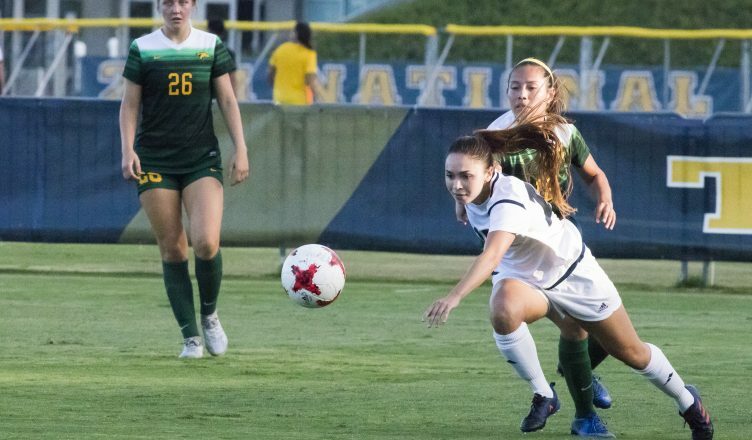 After a four-day break, the seventh-ranked UC San Diego women’s soccer team headed fresh into its clash against Cal Poly Pomona, the only other undefeated team in conference play besides the Tritons. In the end, only a goal separated the two sides as the Tritons scraped away with a 1–0 victory on Friday evening. Since both teams had trouble scoring, the game remained a 0–0 stalemate entering halftime. The Tritons had the upper hand in shots taken with a five-to-two advantage over their opponents, and only two of the five forced a save. What could have been a decisive moment within the first two minutes of the match came for the Tritons as junior forward Mary Reilly was put into a one-on-one situation; however, she could not convert on the opportunity. The deadlock eventually broke open in the second half when, in the 66th minute, the Tritons earned a corner and capitalized off of senior midfielder Jordyn McNutt’s wonderful header, making it 1–0 to the host. With the header, McNutt increased her season rally to four goals, putting her into a three-way tie for most goals on the team. Redshirt sophomore goalkeeper Angelica Ramos did not have much to do on the day as she was only forced into two saves, earning her sixth clean sheet of the season. With the win, UCSD improved to 8–2 overall and 5–0 in California Collegiate Athletic Association play to take the top spot on the leaderboard. After Sunday’s game against Cal State San Bernardino on Sunday, Oct. 1, the Tritons will face off against Cal State San Marcos at RIMAC field on Wednesday, Oct. 4. Kickoff is set for 4:30 p.m.